Metastatic spinal cord compression is observed in 5-10% of cancer patients. The most common primary sites are lung and breast carcinoma. These are followed by lymphoma, plasmacytoma, multiple myeloma, and prostate malignancies. Epidural lymphomas form 9% of all the spinal epidural tumors. An epidural location for lymphoma is observed in 0.1-6.5% of all the lymphomas. Primary spinal epidural lymphoma (PSEL) is a subset of lymphomas, with which there are no other recognizable sites of disease at the time of diagnosis. The incidence of this subset of lymphomas is much less. It, however, is increasingly diagnosed, due to the increased use of more sensitive imaging modalities. In order to study the patient profile, clinical behavior, pathogenesis, radiological and histological findings, prognostic factors, treatment options, and outcomes of the patients with PSEL, a review of the literature was performed. Conclusions and treatment protocols, hence, may be established. PSELs are tumors with a characteristic histopathological picture of a lymphoma which are seen purely in the spinal epidural space, with an accompanying negative diagnostic workup for lymphoma at other sites [Figure 1] and [Figure 2]. A thorough English literature search was conducted to identify the articles in which PSEL was described. The search strategy included the search of journals and an analysis of the bibliographies of the journal articles so identified. For the electronic search, Pubmed was used to identify journals that enlisted and enumerated PSEL from 1961 to January 2011. The following combination of terms: "primary," "spinal," "epidural," and "lymphoma" were used. This resulted in the identification of 80 journals. The review focused on the most significant articles and the data were analyzed by the primary and the senior authors. The bibliographies of the articles were reviewed and any other relevant significant studies were also analyzed. The symptoms and signs of PSEL are similar to those of any other epidural tumor, namely weakness of the upper or lower limbs, back pain, neck pain, sensory deficits, and impairment of bladder or bowel function. , The onset of symptoms is usually subacute, occurring over a few days to weeks. Lymphoma is a disease where "B" symptoms such as weight loss, night sweats, and fever may also be present at the time of presentation. Monnard et al have reported 5.7% of patients to have B symptoms. In PSEL where most of the patients are in either stage I or stage II, systemic symptoms at the time of presentation are significantly low. After the initial clinical examination suggesting a spinal pathology, a high index of suspicion regarding epidural lymphoma is essential. Once imaging studies confirm the presence of a spinal epidural lesion, further workup and treatment ensues. MRI portrays the extent of the epidural lesion much better than myelography. MRI is more sensitive for demonstrating multiple epidural lesions. 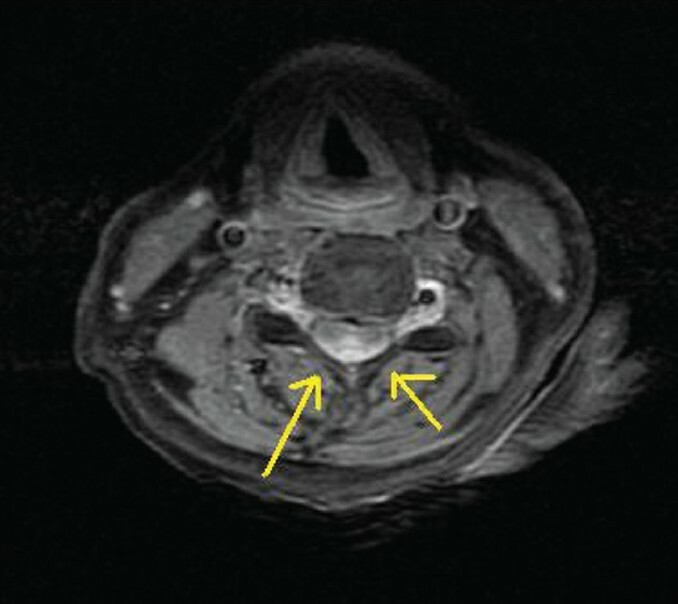 MRI clearly demonstrates the paraspinal extent of the lesion. MRI is the most sensitive technique for the detection of vertebral metastases (T1-weighted images). MRI of the entire spine and brain is recommended. Before the advent of MRI, conventional myelography and CT-myelography were the diagnostic procedures of choice. They remain as useful when MRI is not readily available or for patients unable to undergo MRI; i.e., those patients with severe scoliosis, ferromagnetic implants, programmable shunts, cardiac pacemakers, or severe claustrophobia. All the patients with a histological diagnosis of lymphoma need a complete systemic workup for lymphoma, without which a diagnosis of PSEL cannot be made. In the series by Monnard et al, whole-body CT scan was done in 77% of cases, bone marrow assessment in 96%, cerebrospinal fluid examination in 50%, lactic dehydrogenase measured in 84%, and white blood cell count in 94%. Histopathologically, lymphomas have been classified by various authors. While describing PSELs, authors have used Rappaport, Keil or Revised European American Lymphoma (REAL) classifications, the latest being the WHO classification of lymphomas, initially published in 2001 and then updated in 2008. This is based on the REAL classification scheme. Mackintosh et al have studied 105 cases of NHL wherein they have found that patients with epidural lymphoma are at an increased risk for CNS relapse. However, in these studies, majority of the patients had disseminated lymphoma. Whether the same risk of CNS relapse is carried by the patients with PSEL is yet to be confirmed by larger series with longer follow-ups. It is emphasized that PSEL is a potentially curable disease with good clinical outcome when treated with surgery and multimodality treatment. With the advancing technology, accurate and early diagnosis of this entity, with a complete workup, has been possible. The role of surgery in PSEL is clear. When the diagnosis is not yet established, surgery is clearly indicated. Chemotherapeutic regimes and present day precise delivery techniques of radiotherapy act as the key disease control measures. Adequate physical therapy and intense rehabilitation is of prime importance for functional recovery. A favorable outcome can be expected in patients with PSEL, if diagnosed and treated early, unlike secondary spinal epidural lymphoma that has a poor outcome. 1. Mesfin FB, Drazin D, Berry S, Homan S, Nazeer T, German JW. Diffuse follicle center lymphoma of the spine: A primary epidural lymphoma? Clin Neuropathol 2009;28:395-9. 2. Caðavi F, Kalayci M, Tekin IO, Numanoðlu G, Caðavi Z, Gül S, et al. Primary spinal extranodal Hodgkin's disease at two levels. Clin Neurol Neurosurg 2006;108:168-73. 3. Ultmann JE, DeVita Jr. VT. Hodgkin's disease and other lymphomas. In: Petersdorf RG, Adams RD, Braunwald E, Isselbacher KJ, Martin JB, Wilson JD, editors. Harrison's Principles of Internal Medicine. 10 th Ed. New York: McGraw-Hill; 1983. p. 811-25. 4. Wood NL, Coltman CA. Localized primary extranodal Hodgkin's disease. Ann Intern Med 1973;78:113-8. 5. Samadian M, Vahidi S, Khormaee F, Ashraf H. Isolated, primary spinal epidural Hodgkin's disease in a child. Pediatr Neurol 2009;40:480-2. 6. Herman TS, Hammond N, Jones SE, Butler JJ, Byrne GE Jr, McKelvey EM. Involvement of the central nervous system by non-Hodgkin's lymphoma: The Southwest Oncology Group experience. Cancer 1979;43:390-7. 7. Citow JS, Rini B, Wollmann R, Macdonald RL. Isolated, primary extranodal Hodgkin's disease of the spine: Case report. Neurosurgery 2001;49:453-6. 8. Al-Khayat H, Al-Khayat H, Al-Baker O, Groof A, Sadeq A, Hayati H, et al. Cervical radiculopathy secondary to Hodgkin's lymphoma. Surg Neurol 2007;67:540-3. 9. Love JG, Miller RH, Kernohan JW. 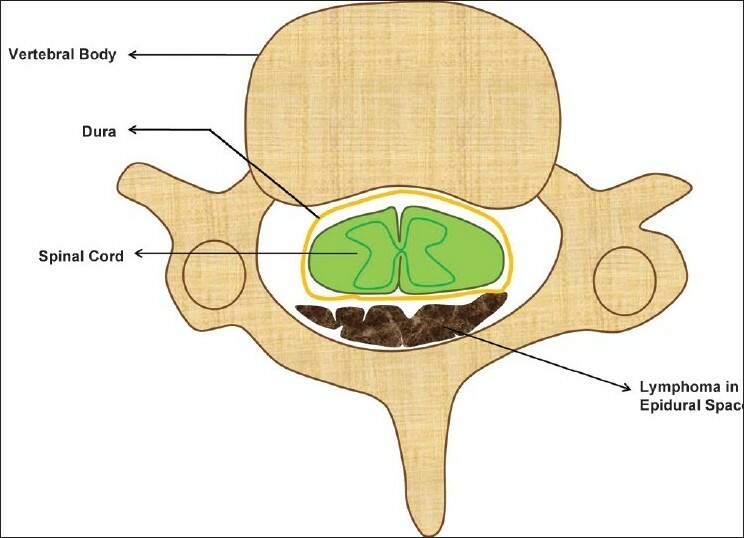 Lymphomas of spinal epidural space. Arch Surg 1954;69:66-76. 10. Tsukada T, Ohno T, Tsuji K, Kita K, Kobayashi T, Deguchi K, et al. Primary epidural non-Hodgkin's lymphoma in clinical stage IEA presenting with paraplegia and showing complete recovery after combination therapy. Intern Med 1992;31:513-5. 11. Otter R, Gerritis WB, Sandt MM, Hermans J, Willemze R. Primary extranodal and nodal non-Hodgkin's lymphoma. Eur J Cancer Clin Oncol 1989;25:1203-10. 12. Rao TV, Narayanaywamy KS, Shankar SK, Deshpande DH. Primary spinal epidural lymphomas: A clinico-pathological study. Acta Neurochir 1982;62:307-17. 13. Boukobza M, Mazel C, Touboul E. Primary vertebral and spinal epidural non-Hodgkin's lymphoma with spinal cord compression. Neuroradiology 1996;38:333-7. 14. Epelbaum R, Haim N, Ben-Shahar M, Ben-Arie Y, Feinsod M, Cohen Y. Non-Hodgkin's lymphoma presenting with spinal epidural involvement. Cancer 1986;58:2120-4. 15. Monnard V, Sun A, Epelbaum R, Poortmans P, Miller RC, Verschueren T, et al. Primary spinal epidural lymphoma: Patients' profile, outcome, and prognostic factors: A multicenter Rare Cancer Network study. Int J Radiat Oncol Biol Phys 2006;65:817-23. 16. Barnard M, Perez-Ordoñez B, Rowed DW, Ang LC. Primary spinal epidural mantle cell lymphoma: Case report. Neurosurgery 2000;47:1239-41. 17. Salvati M, Cervoni L, Artico M, Raco A, Ciappetta P, Delfini R. Primary spinal epidural non-Hodgkin's lymphomas: A clinical study. Surg Neurol 1996;46:339-43. 18. Schwechheimer K, Hashemian A, Ott G, Müller-Hermelink HK. Primary spinal epidural manifestation of malignant lymphoma. Histopathology 1996;29:265-9. 19. Haddad P, Thaell JF, Kiely JM, Harrison EG, Miller RH. Lymphoma of the spinal extradural space. Cancer 1976;38:1862-6. 20. Daley MF, Partington MD, Kadan-Lottick N, Odom LF. Primary epidural burkitt lymphoma in a child: Case presentation and literature review. Pediatr Hematol Oncol 2003;20:333-8. 21. 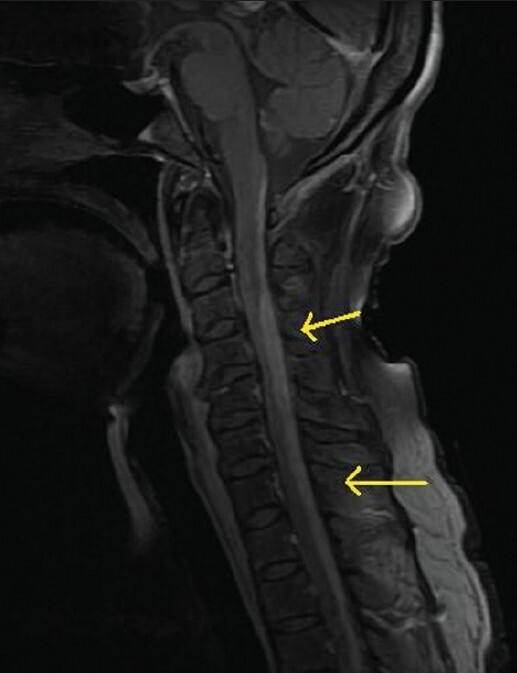 Mora J, Wollner N. Primary epidural non-Hodgkin lymphoma: Spinal cord compression syndrome as the initial form of presentation in childhood non-Hodgkin lymphoma. Med Pediatr Oncol 1999;32:102-5. 22. 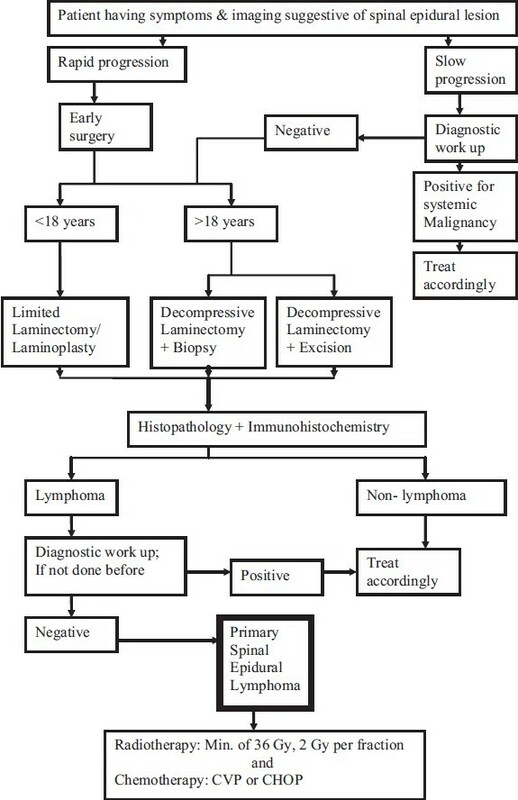 Raco A, Cervoni L, Salvati M, Delfini R. Primary spinal epidural non-Hodgkin's lymphomas in childhood: A review of 6 cases. Acta Neurochir (Wien) 1997;139:526-8. 23. Mizugami T, Mikata A, Hajikano H, Asanuma K, Ishida H, Nakamura C. Primary spinal epidural Burkitt's lymphoma. Surg Neurol 1987;28:158-62. 24. 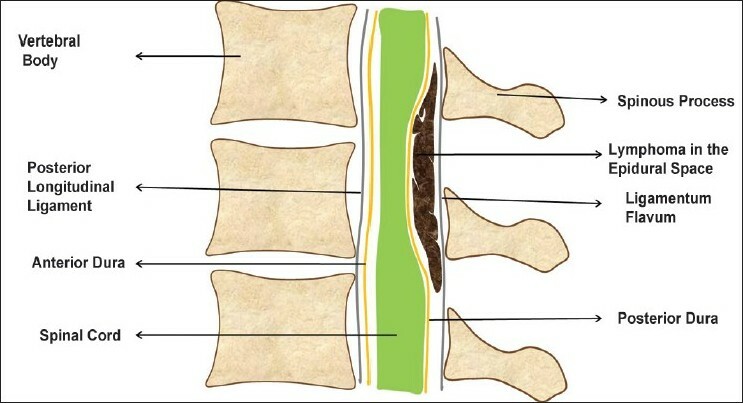 Spinazzé S, Caraceni A, Schrijvers D. Epidural spinal cord compression. Crit Rev Oncol Hematol 2005;56:397-406. 25. Tai SH, Hung YC, Chen JC, Jin YT, Lee EJ. A patient with two episodes of thoracic spinal cord compression caused by primary lymphoma and metastatic carcinoma of the prostate, 11 years apart. Kaohsiung J Med Sci 2010;26:506-10. 26. Mascalchi M, Torselli P, Falaschi F, Dal Pozzo G. MRI of spinal epidural lymphoma. Neuroradiology 1995;37:303-7. 27. Helweg-Larsen S, Wagner A, Kjaer L, Johnsen A, Boesen J, Palner T, et al. Comparison of myelography combined with postmyelographic spinal CT and MRI in suspected metastatic disease of the spinal canal. J Neurooncol 1992;13:231-7. 28. Lyons MK, O'Neill BP, Marsh WR, Kurtin PJ. Primary spinal epidural non-Hodgkin's lymphoma: Report of 8 patients and review of the literature. Neurosurgery 1992;30:675-80. 29. MacVicar D, Williams MP. CT scanning in epidural lymphoma. Clin Radiol 1991;143:95-102. 30. Negendank WG, A1-Katib AM, Karanes C, Smith MR. Lymphomas: MR imaging contrast characteristics with clinical-pathologic correlations. Radiology 1990;177:209-21. 31. Li MH, Holtas S, Larsson EM. MR imaging of spinal lymphoma. Acta Radiol 1992;133:338-42. 32. Ho L, Valenzuela D, Negahban A, Wassef H. Primary spinal epidural non-Hodgkin lymphoma demonstrated by FDG PET/CT. Clin Nucl Med 2010;35:487-9. 33. Enzmann DR, DeLaPaz RL. Tumor. In: Enzmann DR, DeLaPaz RL, Rubin JB, editors. Magnetic resonance of the spine. St. Louis: Mosby; 1990. p. 301-422. 34. Guermazi A, Brice P, de Kerviler EE, Fermé C, Hennequin C, Meignin V, et al. Extranodal Hodgkin disease: Spectrum of disease. Radiographics 2001;21:161-79. 35. Shirkhoda A, Ros PR, Farah J, Staab EV. Lymphoma of the solid abdominal viscera. Radiol Clin North Am 1990;28:785-99. 36. Zimmerman RA. Central nervous system lymphoma. Radiol Clin North Am 1990;28:697-721. 37. Van der Wall H, McLaughlin AF, Southee AE. Gallium scintigraphy in tumor diagnosis and management. In: Murray IP, Ell PJ, editors. Nuclear medicine in clinical diagnosis and treatment. Vol. 2. Edinburgh: Churchill Livingstone; 1998. p. 813-29. 38. Drake RL. Lymphosarcoma involving the epidural space. J Kans Med Soc 1941;42:212-22. 39. Blakslee GA. Compression of the spinal cord in Hodgkin's disease: A case thirteen years duration with recession of symptoms following Roentgen-ray therapy. Arch Neurol Psychiatr 1928;20:130-7. 40. Verda DJ. Malignant lymphomas of the spinal epidural space. Surg Clin North Am 1944;24:1228-44. 41. Fried G, Ben Arieh Y, Haim N, Dale J, Stein M. Primary Hodgkin's disease of the bone. Med Pediatr Oncol 1995;24:204-7. 42. Cowie F, Benghiat A, Holgate C. Primary Hodgkin's disease of bone. Clin Oncol (R Colloid Radiol) 1991;3:233-5. 43. Higgins SA, Peschel RE. Hodgkin's disease with spinal cord compression: A case report and a review of the literature. Cancer 1995;1:94-8. 44. Iizuka H, Nakamura T, Kato M. Malignant lymphoma of the spinal epidural space. Report of three cases. Neurol Med Chir (Tokyo) 1989;29:307-11. 45. Lyons MK, O'Neill BP, Kurtin PJ, Marsh WR. Diagnosis and management of primary spinal epidural non-Hodgkin's lymphoma. Mayo Clin Proc 1996;71:453-7. 46. Eeles RA, O'Brien P, Horwich A, Brada M. Non-Hodgkin's lymphoma presenting with extradural spinal cord compression: Functional outcome and survival. Br J Cancer 1991;63:126-9. 47. Alameda F, Pedro C, Besses C, Galitó E, Mariñoso ML, Munne A, et al. Primary epidural lymphoma. Case report. J Neurosurg 2003;98(2 Suppl):215-7. 48. Aabo K, Walbom-Jorgensen S. Central nervous system complications by malignant lymphomas: Radiation schedule and treatment results. Int J Radiat Oncol Biol Phys 1986;12:197-202. 49. Correale J, Monteverde DA, Bueri JA, Reich EG. Peripheral nervous system and spinal cord involvement in lymphoma. Acta Neurol Scand 1991;83:45-51. 50. Rathmell AJ, Gospodarowicz MK, Sutcliffe SB, Clark RM. Localized extradural lymphoma: Survival, relapse pattern and functional outcome. Radiother Oncol 1992;24:14-20. 51. Friedman M, Kim TH, Panahon AM. Spinal cord compression in malignant lymphoma: Treatment and results. Cancer 1976;37:1485-91. 52. Oviatt DL, Kirshner HS, Stein RS. Successful chemotherapeutic treatment of epidural compression in non-Hodgkin's lymphoma. Cancer 1982;49:2446-8. 53. Kahl C, Hirt C, Decker S, Gläser D, Rohde S, Jost K, et al. Multimodal therapy for localized spinal epidural follicular lymphoma. Onkologie 2010;33:381-4. 54. Di Marco A, Campostrini F, Garusi GF. Non-Hodgkin's lymphoma presenting with spinal epidural involvement. Acta Oncol 1989;28:485-8. 55. White WA, Patterson KH, Bergland RM. Role of surgery in the treatment of spinal cord compression by metastatic neoplasm. Cancer 1971;27:558-61. 56. Mullins GM, Flynn JP, El-Mahdi AM, Mcqueen JD, Owens AH Jr. Malignant lymphoma of the spinal epidural space. Ann Intern Med 1971;74:416-23. 57. Mackintosh FR, Colby TV, Podolsky WJ, Burke JS, Hoppe RT, Rosenfelt FP, et al. Central nervous system involvement in non-Hodgkin's lymphoma: An analysis of 105 cases. Cancer 1982;49:586-95. 58. Lakshmaiah KC, Lokanath D, Suresh TM, Babu KG, Ramesh C, Rao CR, et al. Spinal cord compression by primary non-Hodgkin's lymphoma. Indian J Cancer 1995;32:81-4. Bruneau, O. and Le Moigne, F. and Guyotat, J. and Nicolas-Virelizier, E. and Guilloton, L. and Drouet, A.
Kasper, E.M. and Lam, F.C. and Luedi, M.M. and Zinn, P.O. and Pihan, G.A.